If you want to hear your favorite stories or use voice quality to describe processes in your website, Balabolka is for you. 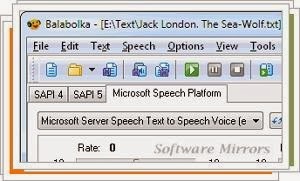 This program allows you to create an audio file with the contents of a document. Balabolka is very easy to use. You just need to select the document you want to convert, and then choose the voice that reads the text. In the same window you have the options to set the reading speed and audio volume. Once done you can export the audio to MP3, WAV and other popular formats. Balabolka also supports the most common file format as input, such as Microsoft Word documents. As if all this were not enough, the program can expand your library of voices by adding extra files you can get on the site itself. If you always wanted to have an assistant read your writings or just want another voice to narrate your videos, you can not miss the opportunity to get Balabolka.